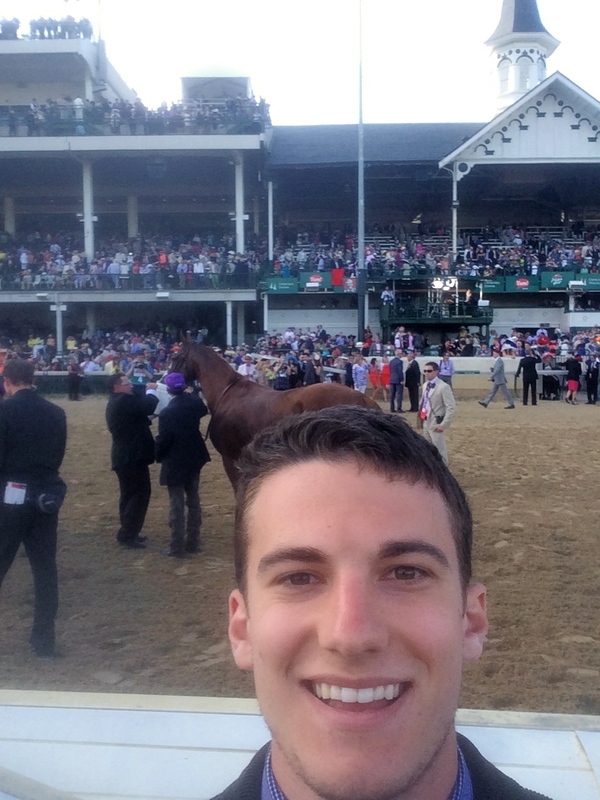 The highlight of the end of each school year at Wash U is going to the Kentucky Derby, which is conveniently held smack dab in the middle of finals. I have always lucked out and had an easy finals schedule, so I have made the trip now 4 years in a row. This year, I decided to come up a day earlier for the Kentucky Oaks, which is basically like the Derby but the day before. The day before I was supposed to leave for the Kentucky aka Wednesday, my friends all bailed on me. 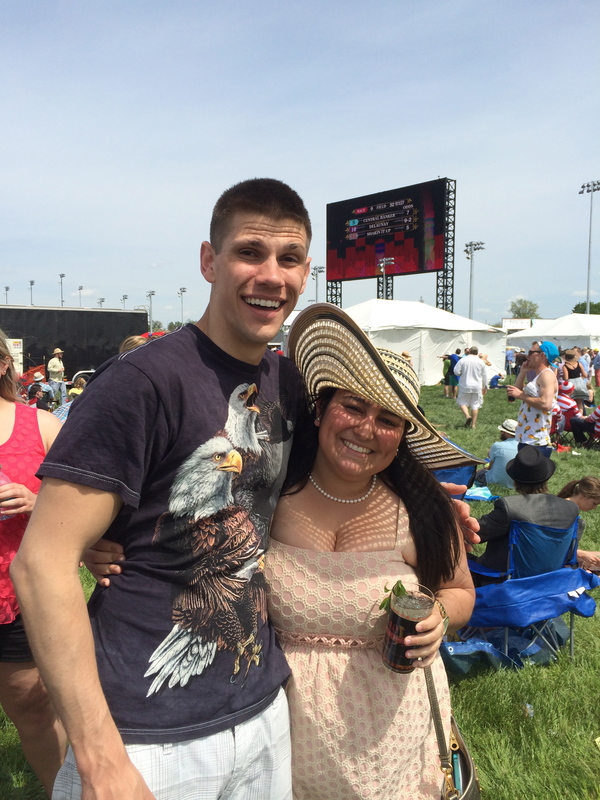 I decided that that the Derby was too much fun to pass up on even though I would be going alone. It would be a different experience, which is always exciting. I bought a general admission ticket, which gives access to the bottom floor of the grandstands and the infamous infield. While seats to the Derby cost at least $200, general admission tickets are just $50, although you can’t actually see the race from anywhere in the general admission area. Despite having been to the Derby for 3 years, I have never seen the actual race and only saw horses on the video boards. Watching the 2011 Derby from the video boards. 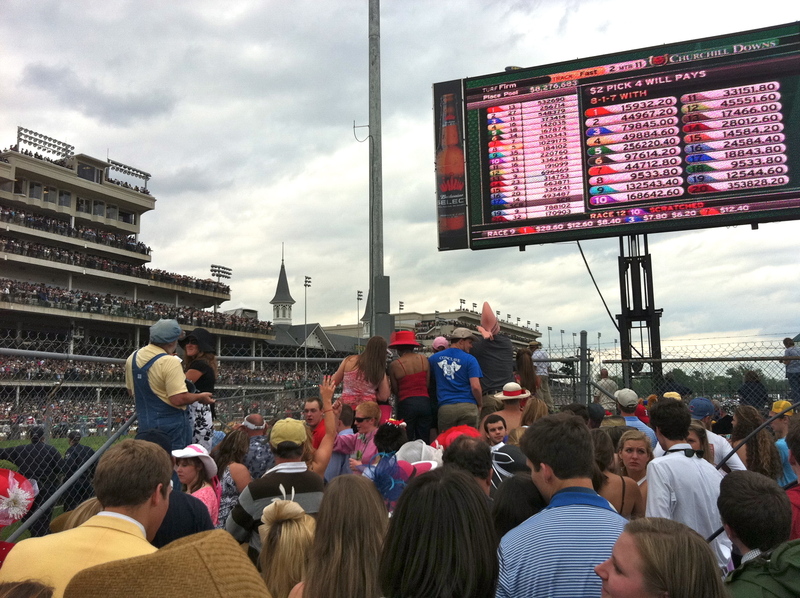 This year, Churchill installed the largest screen in the world on the backstretch. I left on Thursday afternoon and got to Louisville around 8. This year, like every year, I was staying with my family friends Sally, Rob, and Reid. They are the most easy-going family on the planet. 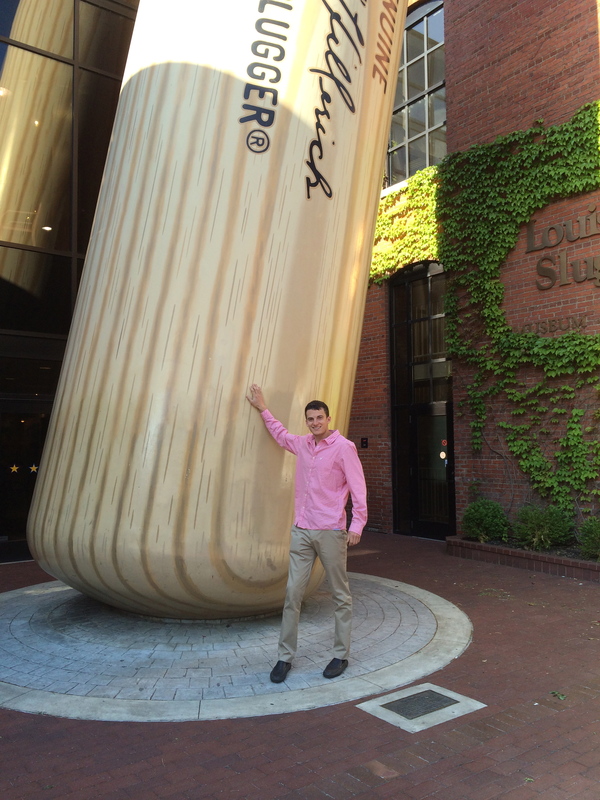 After a Friday morning tour of the Louisville Slugger bat factory, Reid drove me down to Churchill Downs for the Kentucky Oaks. Instead of going to the track, Reid decided to shuttle people to make some money. He apparently did very well. 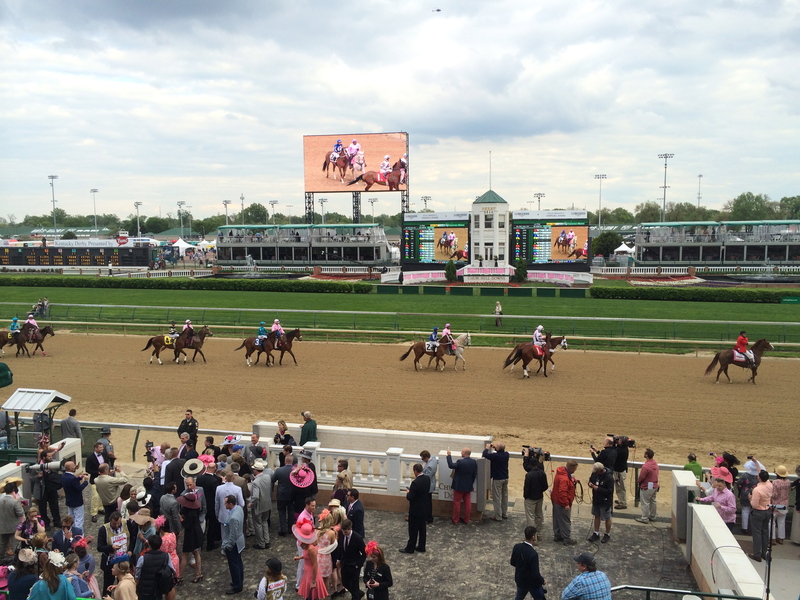 The Oaks is just like the Derby except there are less people and everyone wears pink (for breast cancer awareness). After going to the restroom near the Paddock (where the horses get saddled before walking onto the track), I decided to look at a laminated sheet of paper describing the different levels of clearance/access at Churchill Downs for Oaks and Derby (there are about 50 levels). After staring at the paper for a few minutes, a man who worked for Churchill Downs approached me and asked me why I was reading the paper. This man, whose name is Bill, manned the gate where press photographers access the racetrack. The gate was also along the walkway that the horses, jockeys, and owners entered the track. This gate was actually the only access point to the track from the grandstands. Bill and I ended up chatting for about 3 hours. Eventually, Bill asked me if I wanted to see the race. I said yes, and he walked with me down through the tunnel all the way to the railing of the racetrack. 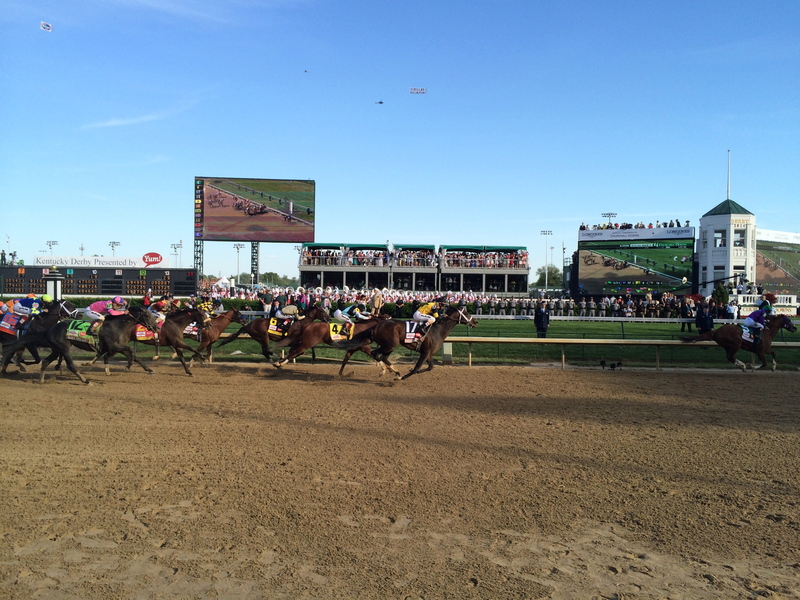 There, I watched my first race at Churchill Downs. After the race, they opened the gate to allow the horses to go back to the paddock. Seizing the opportunity, I stood on the track and had Bill take my picture. I couldn’t believe that I was actually standing on the racetrack! Little did I know what was to come. 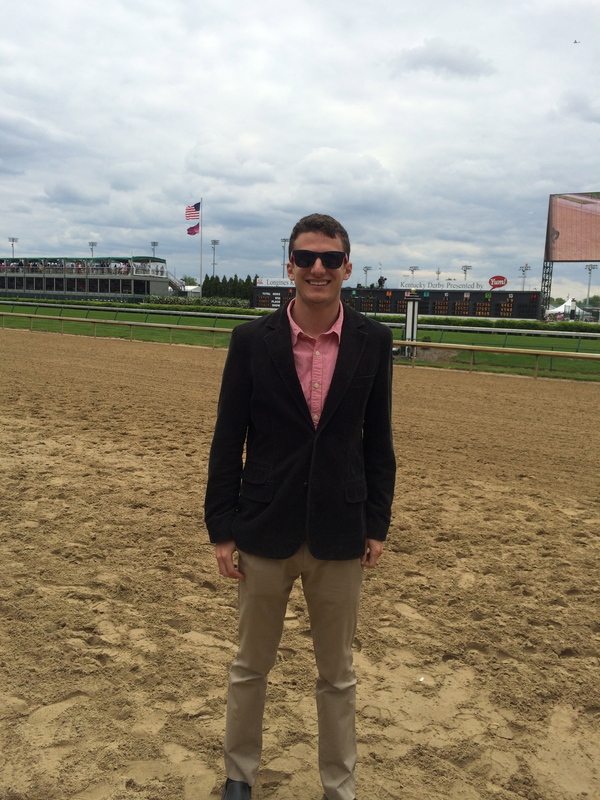 On the track at the Kentucky Oaks! 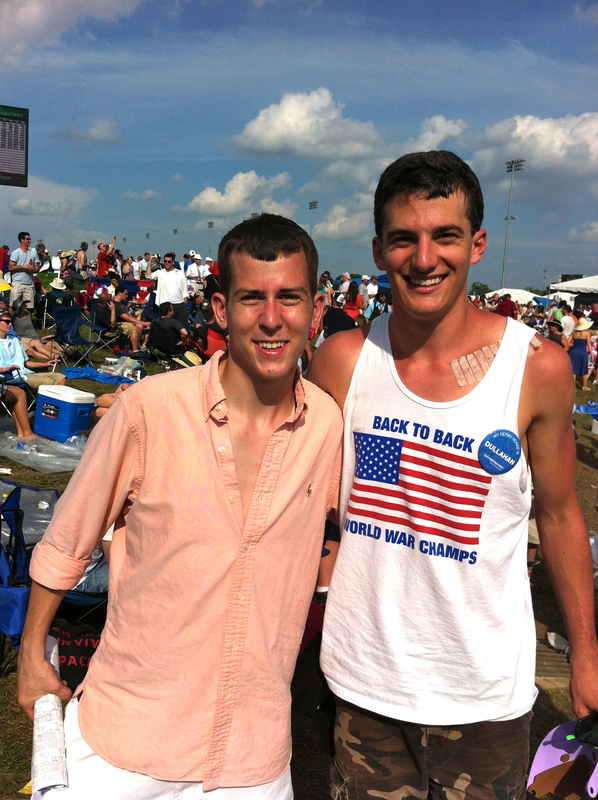 The rest of the Oaks day was pretty awesome. I won $100 betting on the Oaks race. Then, I was able to sneak up into the expensive box seats for Race #12. Before leaving the track, I stopped back at the gate to say thank you to Bill. When I told him I would be returning tomorrow, he smiled and said that he would take care of me. The next day, Derby Day, was a lot crazier than Oaks Day. 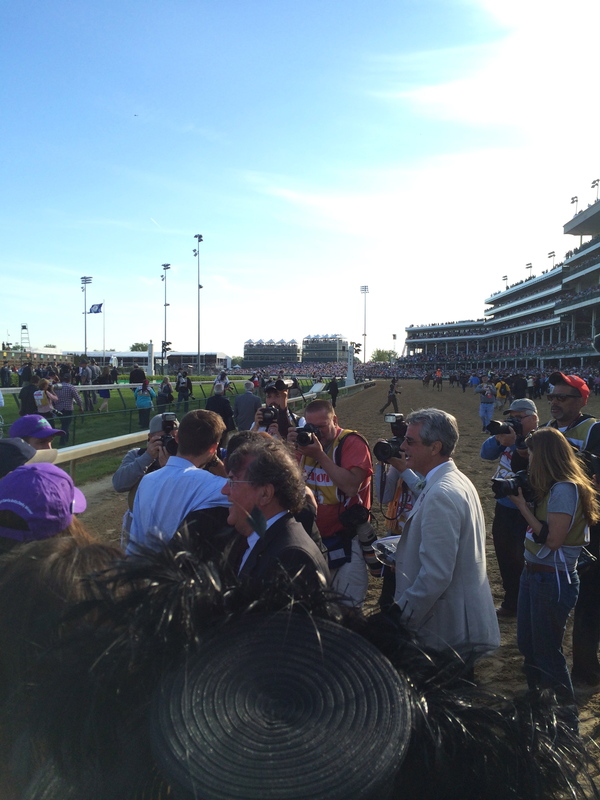 After entering the track around 11:30 AM, I immediately went over to Bill, who was surrounded by a mob of people. Eventually, he noticed me and we shook hands before he told me to come back for the Derby race at 6:30 PM. For the 7 hours in between, I enjoyed some of the best people watching on the planet. I also ran into my friends Sarah, Blake, and Mary Pat. When it was almost time for the race, placed my bet on California Chrome, put on my California Chrome button from yesterday, and walked over to Bill’s gate. After watching the horses and the owners walk by, he opened the gate and let me through. I was then standing directly on the railing behind about 3 rows of people. Noticing that some of the press photographers were in front of the railing, I too decided to go in front. 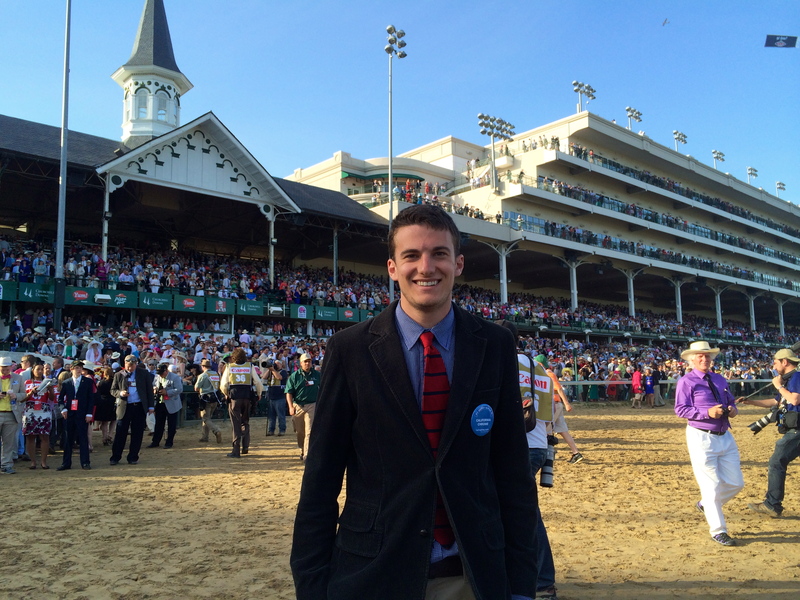 I was now standing on the racetrack for the Kentucky Derby with no credentials. After California Chrome won the race, the owners, trainers, and all the reporters walked across the track to the Winner’s Circle, so I followed. 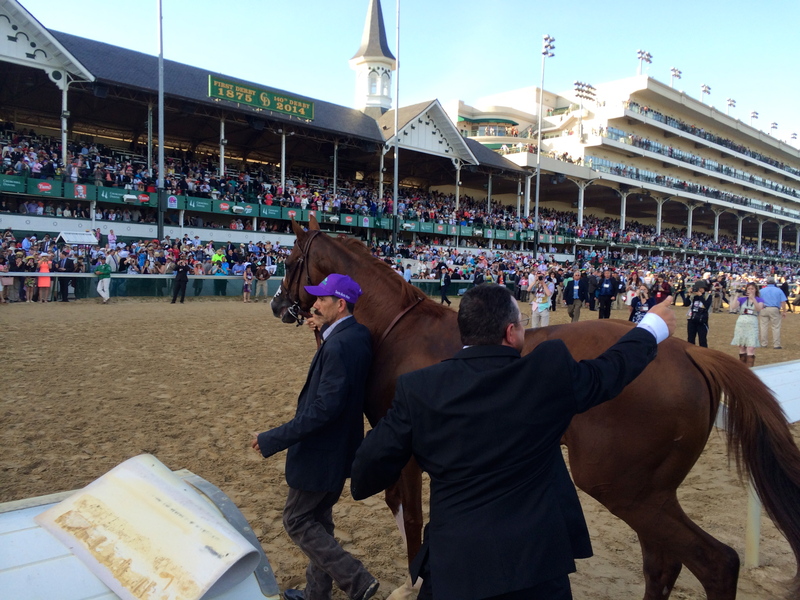 Because I had the California Chrome button, the guards at the Winner’s Circle let me in! I hugged the trainer, Art Sherman, who cried in my arms. I also shook hands with one of the owners. The horse walked right by me! So I decided to snap a selfie with it. Finally, I asked someone to take a picture of me on the track. It turned out really nicely. Strangely, having my friends ditch me created a spiral of events that all played out in my favor to get me to the Kentucky Derby winner’s circle. 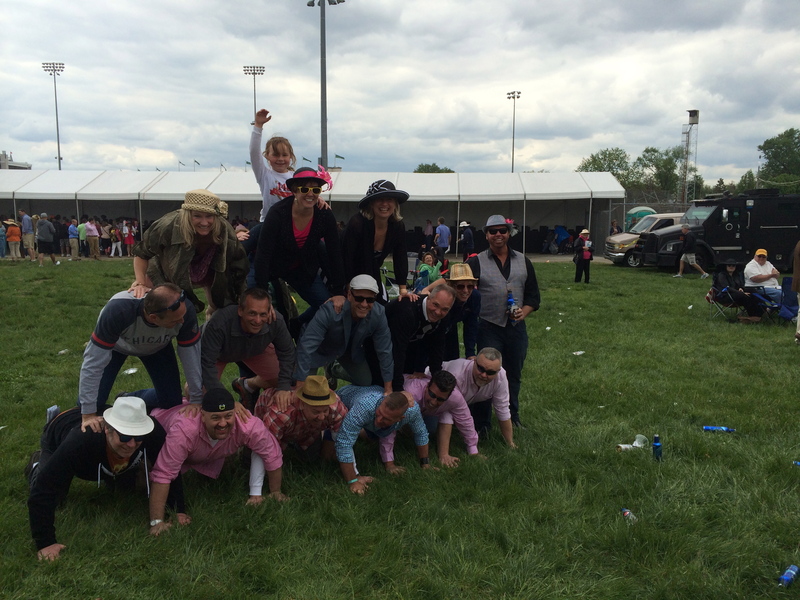 The biggest lesson I learned from Derby 2014 is to not be afraid to do things alone, because rather than chill with friends, I am forced to actively seek new experiences.